Laser technology has come a long ways since the last edition was published in 2008, so I have extensively revised Understanding Lasers to bring it up to date. The most obvious change is a new chapter on fiber lasers, which have come into wide use for industrial machining and other materials-working and high-power applications. I also expanded coverage of nonlinear optics, short-pulse generation, and techniques for generating new laser wavelengths. Less visibly, I updated the whole book with a decade's worth of advances in lasers and optics and new applications. Keeping up with that progress means the book has grown more than a hundred pages to 586 pages (including index). What has not changed is the purpose of Understanding Lasers: to provide a user-friendly introduction to lasers and related optical technology. It is richly illustrated with line drawings that help explain the workings of lasers and optics. It includes little mathematics beyond basic algebra to understand this fascinating and important technology. I explain basic concepts, spelling out acronyms, and giving examples. I have been writing about laser technology for more than four decades, so I draw on an extensive background, including writing monthly review features and giving tutorial webcasts for Laser Focus World. 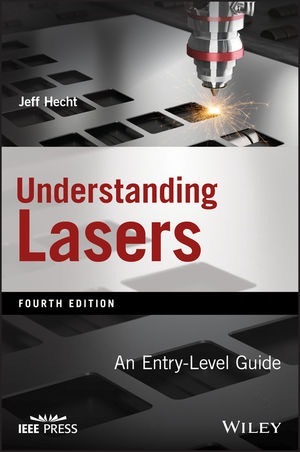 The book includes a glossary of laser terms, some suggested references and handy formulas, multiple choice quizzes so you can test your knowledge, and an index I fussed over because I want the book to be a useful reference. It's the sort of book I would have loved to have when I got started in lasers. The table of contents is below. To read some of my laser articles, check out what I have written lately for Laser Focus World. 1.3 What Is a Laser? 1.6 How Lasers Are Used? 1.7 What Have We Learned? 2.6 What Have We Learned? 3.7 What Have We Learned? 4.8 What Have We Learned? 5.9 What Have We Learned? 6.9 What Have We Learned? 7.11 What Have We Learned? 8.1 What Is a Solid-State Laser? 8.8 What Have We Learned? 9.1 What Are Fiber Lasers? 9.7 What Have We Learned? 10.11 What Have We Learned? 11.7 What Have We Learned? 12.12 What Have We Learned? 13.11 What Have We Learned? 14.13 What Have We Learned?